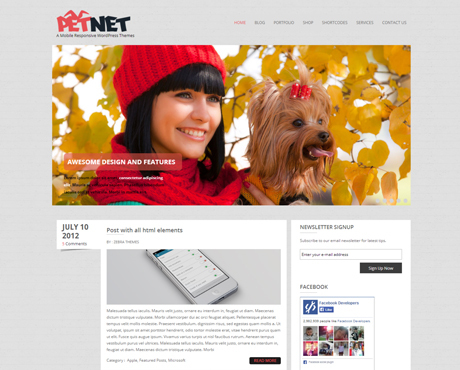 PetNet WordPress theme is the ultimate solution for your pets oriented website creation. Based on bootstrap css framework, PetNet WordPress theme gives you the perfect resolution you need on your gadgets screen. Giving web platform for selling pets utility products had never been easier as this theme comes with Woo commerce online shop feature. Intuitive and easy to use options page. Beautiful Featured Image Slider included. Tested with latest WordPress versions. Social Media and Adsense included. Tested in all major browsers.